(Phys.org) —The Rutherford School Physics Partnership is giving A-level physicists a unique opportunity to tackle a real research problem. 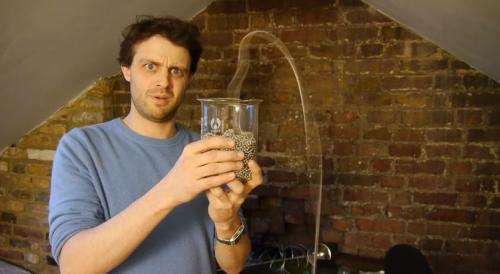 The problem of the chain fountain was revealed by BBC Science presenter Steve Mould. 2.8 million people have watched his video demonstration of a chain appearing to defy gravity by first leaping out of a pot before falling to the ground. Professor Mark Warner and Dr John Biggins have published the first formal explanation of the physics behind this puzzle in Proceedings of the Royal Society A, as they discovered that Mould's explanation was wrong..
Alongside this paper, the Rutherford Schools Physics Partnership has published a collection of problems which take sixth-form scientists from their AS knowledge to an explanation of the research problem. The collection will be available on the RSPP on-line learning platform. "This is a unique opportunity," explained Professor Warner. "Because physics is such a linear subject, it normally takes years to build up to tackling a research problem like this one." "The key insight into the chain fountain is that, if you pick a chain up from a table, as well as you pulling the chain into motion the table must also push. Only then can you get a fountain at all. The whole question of the rise relates to fundamentals of momentum conservation along with energy balance. It relates to a wide class of such problems in nature and in technology." "For the problem of the chain fountain, the Rutherford School Physics Partnership has been able to publish a collection of problems which, when worked through, will take young people from the simple statics of chains to the model which predicts how high the fountain should rise." "We hope that by showing how the problems studied at school relate to real academic challenges, young people will develop confidence in their ability to solve physics problems and be inspired to continue studying physics to a higher level." The Rutherford School Physics Partnership is a project designed to offer support and extension activities in physics problem solving to teachers and students transitioning from GCSE (Y11), through to Sixth Form (Y12 & 13), through to university, by combining an on-line study tool with face-to-face events at partner schools and institutions across the UK. "We will be looking to exploit the surprises that Steve Mould revealed in a much wider range of problems that we are working on," added Dr Biggins. "We hope that the young people taking part in the Rutherford Schools Physics Partnership will be working on them alongside us." The "Physics experts" Biggins and Warnerhave it ALL wrong..
is due to centrifugal force. Physics 101 stuff. Furthermore there is a video of macaroni doing the same thing, and macaroni is not made of tiny rods and beads. Sorry to deflate the mystery! I would like to hear Biggins and Warner explain why I am wrong. I have seen this many times in extension cords and mardi-gras beads. I don't think the chain has much to do with it. His round beads in the second alternate are so far apart that they are striking the wall of the container at an orthogonal (perpendicular) angle, which slows the beads down and prevents them from building up speed. He was trying to support his claim that the shape of the beads and the length of the void between beads or links was the key issue, but he inadvertently introduced a non-controlled variable, which is this "ratcheting" in the collision of those beads with the container wall, which nulls that experiment. In the case fo beads close together, they move over the container wall early on in a smooth enough manner so that they don't get stopped, don't experience that ratcheting, and so it accelerates to peak velocity right away. Key difference. His on-paper explanation could be possible, but the deal is a link with a string like that should pivot around the end. It would make sense to at least study it "Mythbusters style," with a high-speed camera, to see whether his explanation is happening at all. I think it makes no sense to treat the CoG of the object as a fulcrum, since the point of contact is the back corner. It's no different than if you were to pick up a piece of 2-by-4 from one end. The opposite end, not the middle, behaves as a fulcrum. The fountain might be explained in terms of inertia and terminal velocity. Because it is an extended object, it continues accelerating throughout it's entire length. A denser chain has more inertia, so as the falling part pulls on the other part, it lifts that part UP, but because of inertia it wants to keep going up, so it "coasts" some while gravity starts to kick in, thereby producing the arc. The momentum of each link determines how much momentum gets transferred to the next link, which is why dropping it farther distances works better. I would need to experiment with a few things myself, because I've never tried this "experimentally," even though I said above that I believe I've seen this effect before. I think there are one or two tests I could do to further explore my ideas and theirs, and possibly rule out either their position, or a certain alternative I'd have in mind, which they did not address at all in the video. You could test for inertia or centrifugal forces by "pressing" down on the arc of the fountain from above, and seeing if you feel pressure. if the arc maintains most of it's characteristics in spite of hitting your hand, then it would actually be a centrifugal effect, not a centripetal effect. Now for example, if you have a container 5m above the ground level, and the container wall is 10cm. When you drop the leading edge of the chain to a level below the 5m mark, plus a bit more to overcome friction, the gravity accelerates it. The lead accelerates all the way down to the ground, while the tail end accelerates upward 10cm. Lead gains 12.35J kinetic energy per kilogram mass. Trail gains initially same amount of kinetic energy in the opposite direction, because it is deceptively being pulled up and over the edge of the container at the same speed the lead is falling, in this case 4.97m/s. This is key, because inertia will want to carry it some distance upward as gravity tries to slow it, but it is also limited by tension from the lead end. Now if not for tension from the lead, it would actually take a full second for gravity to now "slow" the tail back down, but the lead causes this to happen faster. The result is a sweet spot, the fountain, between the two effects. Imagine this as a rolling wheel, with no axle and no spokes or rims of any kind,a nd we imagine that the wheel is unbalanced (not in the perpetual motion sense, but like unbalanced tire or something). Of course, we all know the back side of a wheel goes upwards even as the front side goes down, because their states are "entangled" in a classical sense. The back side is not being "pushed up" by the table. It is under tension from the lead side of the chain, and as such, as long as the chain doesn't break or snag, it is "entangled" in a classical sense, with the motion of the lead. Each new link in the chain is accelerated upward to the speed that the lead of the chain is falling, until it reaches the curve. inertia wants it to keep going straight, but a combination of gravity and tension don't want that to happen. the result is the curve gets pushed higher until it reaches an optimum where inertia and gravity are balanced. SO what pulls the chain upward (into the arc above the edge of the container) is the inertia of the back part of the chain. What pulls downward is obviously gravity. the walls of the container need to be vertical (not the rounded bowl he had for one example,) as being pulled up veritically is crucial for maximizing the amount of the inertia which is expressed vertically to produce the maximum height of the fountain. Obviously the longer the fall for the leading edge the more acceleration, which is the biggest factor. anyway, simply throwing the chain over the edge of a round bowl won't work well, because the direction the trailing end of the chain get accelerated isn't vertical, it's more like 45 degrees. You can prove that by doing the obvious, which is testing with the chain just starting on a flat surface, chain going over any rail vertically (nothing special about a glass container,) or going over a 45 degree ramp. One makes no fountain, one a bad fountain, the other is good. Okay, the theory presented in the video is definitely wrong. He simply didn't test enough types of chain and materials to see why. I just bought a 24ft long set of basic, spherical white plastic beads, one quarter inch with one eighth inch spacing between them. Using a heavy mug as the container, I tried it at about 3ft of elevation and did not get the fountain effect. I raised the elevation to about 6ft and briefly, for about a quarter second to half second, the round plastic beads chain came up and hovered over the rim of the mug, just like the metal, rectangular linked chains do in the videos, it just isn't quite as pronounced. This proves that the theoretical "lever" effect he was describing, using the Normal force and the rotation of the square links, etc, is not correct. In fact, I think with a bit of work, I may be able to get it on video, and show that no container wall at all is needed to produce this effect, though it does help; looks more "magical" and impressive. I watched the rest of Mould's video, and I don't get what these university guys were talking about. He used round beads in his demonstration, so the professor's explanation that it had something to do with long beads and a lever action was wrong to begin with. Biggins and Warner have done a very weak job in demonstrating that the effect is due to the geometry of the beads. Their demo may be entertaining to school children, and the public in general, but lacks scientific rigor. I would send them back to the lab to try other materials such as wire rope with a teflon jacket and fluids with particles suspended running through a siphon. I believe the metal beads are effective in demonstrating the phenomenon due to their great mass, low friction and flexibility. Testing with materials of equal mass and flexibility, but without the rod/bead construction would be revealing. This is why I would recommend wire rope with a plastic or teflon coating. In the end I believe this will be debunked and it will be due to a combination of "inertia, centripetal force, angular motion and yes "Centrifugal Effect"